Mix all ingredients together and spoon into a (8x8) square baking dish. Bake at 350 degrees for 20-30 minutes or until hot and bubbly. 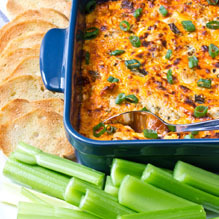 Serve with corn chips, crackers and/or celery stalks. Can be made one day in advance and refrigerated before baking.